Thanks to Wintergreen Resort for sponsoring this post and for showing us where to getaway from the summer heat of summer! 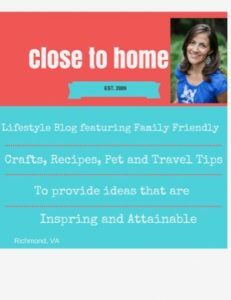 This has been the summer of firsts for our family and focusing our summer adventures on where to getaway from the summer heat of Richmond, VA. We have hit Hershey Park and Busch Gardens to name a few. The thing I love but don’t appreciate about where we live is that you can get to the beach or the mountains in just 2 hours. 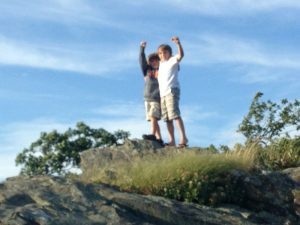 Well in the 14 years here we decided to getaway from the heat and hit the Virginia Blue Ridge Mountains and visit a well-known ski resort in the Summer. I have traveled to Colorado resorts in the summer but never thought Wintergreen Resort would have so much to do in the summer!! 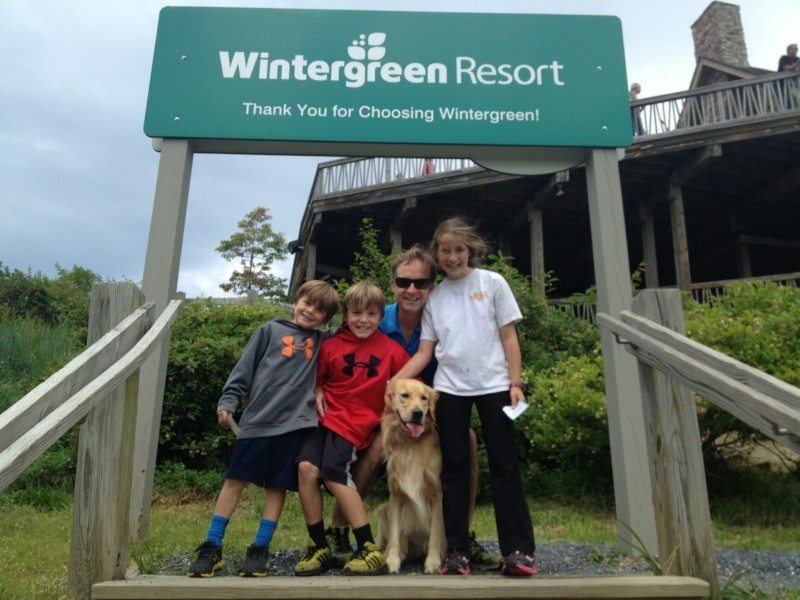 If you are not familiar with Wintergreen Resort, it truly is a four season resort. This 11,000-acre mountaintop destination is great for families or group getaways. Wintergreen Resort has 300 villa-style condominiums and rental homes from studio suites to seven bedroom homes that range from $155- $1,590 for the 2013 season. This might seem high but they are all fully equipped with kitchens so you can save on making meals from home instead of having the additional costs of restaurant meals. I would recommend bringing most of your food as the grocery selections are limited. 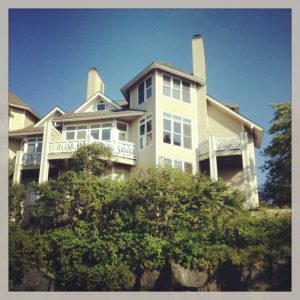 You are sure to find the perfect place for any size group from a single family to family reunions. FYI: there are no dog friendly properties for rent through Wintergreen’s website. If you want to bring a dog check out any VRBO listings**. There are plenty of Dogs on leashes on the resort so many areas are dog friendly. Tennis : 19 outdoor clay courts and 3 indoor clay courts. Discovery Ridge- An activity area that has a Zip line, summer tubing, rock wall climbing, bungee jumping, video game room, and miniature golf. Our family spent several hours each day exploring Discovery Ridge and all the fun activities in the area. The Tubing was amazing!! Lake Monocan Park–A 20 acre lake where you can rent kayaks,canoes or water bikes, it has a beach area, fishing and more. The kids had fun jumping off the water trampoline and my husband spent most of his time in a canoe or fishing off the banks. HIKING : There are 30 miles of marked hiking trails on the property, not to mention the ones below the mountain we did not have time to explore. 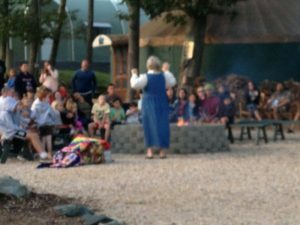 Children’s camps and evening activities. At the time of our visit they were offering an Activity pass that proved to be a great deal and kept the kids entertained for two days with activities at one price! Friday night we went to the fire pit and listened to the story-teller and roasted S’mores (free of charge). We were going to go to the movie Saturday night but it was just too cold for the adults!! I did not pack appropriately. While I did not visit the fitness center, we took hikes and walks they are fully equipped with strength and conditioning circuit training as well as cardiovascular equipment. They have both indoor and outdoor pools and hot tubs. If we had more time I am sure the indoor pool would have been a hit. It was plenty cool up there that I think even my kids may have been too cold for outdoor pools. As I mentioned the accommodations at the Wintergreen Resort include a full kitchen so we only had dinners out. The food at the Edge was decent but I could tell some of the menu items would be more appealing coming off a day of skiing then a summer getaway. The Edge is the most casual place on the resort so our expectations were not very high. There are several other options but we chose to eat off the property and down the mountain with some friends who own a condo at Wintergreen. Breweries have popped up all over Nelson County Va and they all have great outdoor seating to enjoy the amazing views. 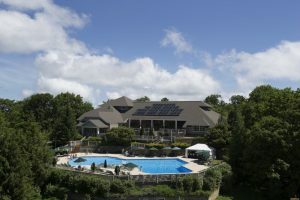 SO if you can’t stand the heat of summer, this is where to get away: Wintergreen Resort with the family, for a guys or girls weekend or even as a romantic getaway. The views are spectacular and there is no reason for anyone to say, “I’m bored”. Send them on a hike, the elevation will tire them out. WE HAD AN AWESOME TIME AND CANT WAIT TO GET BACK TO THE COOL MOUNTAIN AIR. One of the only places I know where you can GOLF and SKI on the same lift ticket!! wow that looks beautiful! love the lake and the mountains! This place looks fabulous! I really want to go for the indoor pool! Thanks for sharing, I’m searching for a vacation spot for next year but with that pool and the views maybe we’ll make it a winter vacation. Wow! This is the most beautiful destination I’ve never heard of! Love it! The condos look so beautiful! Now I’m thinking I have to visit! Wow, it looks beautiful. Seems like they’ve got something for everyone there. It looks beautiful! I would love to go visit! It sounds like a blast too. Thanks for sharing this. I’m in North Carolina, so this can’t be too far from me either. It’s definitely something our family should check out. We always go to the beach, but need to check out more mountain vacation spots too! Looks like a really fun place to go with the family! exactly full of activities 365 days a year. That certainly looks like one amazing place to get away from it all–not only the summer heat! Wow! That looks absolutely amazing! If I’m ever traveling I am definitely checking out this place! Thank you for sharing. This looks amazing! 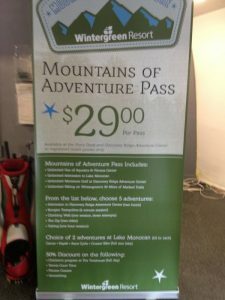 I’d never heard of Wintergreen Resort before but will have to check it out since I’ve been looking for a nice spot to vacation. Everything just looks so beautiful there! Great pictures. I love that you also visited Hershey Park, I’ve been itching to bring my kids there too!